Welcome to Sanderson's Wooden Bowls. All the bowls displayed on this website and in our workshop are made by us, Sam and Weeza Sanderson, at our studio in Vermont's Northeast Kingdom. This area of Vermont has been home to my family since the early 1800's. For eight generations, my family has been loggers, farmers, and tradesmen. I was born in the farmhouse that houses our workshop and studio, and is still a working farm where we raise Nigerian dwarf goats and miniature donkeys. Since 1984, my wife Weeza and I have been in woodworking, doing retail work and custom sawing with a sawmill on our property. Our passion for creating wooden bowls grew out of this and our relationships with other local Vermont woodworkers and furniture makers. We have discovered what character and beauty are in some of the old growth trees and in the burls that would ordinarily be thrown into the woodpile or left in the woods. Our woodworking studio is open to the public, and we encourage visitors to the area to stop in and see how our Vermont wooden bowls are made. 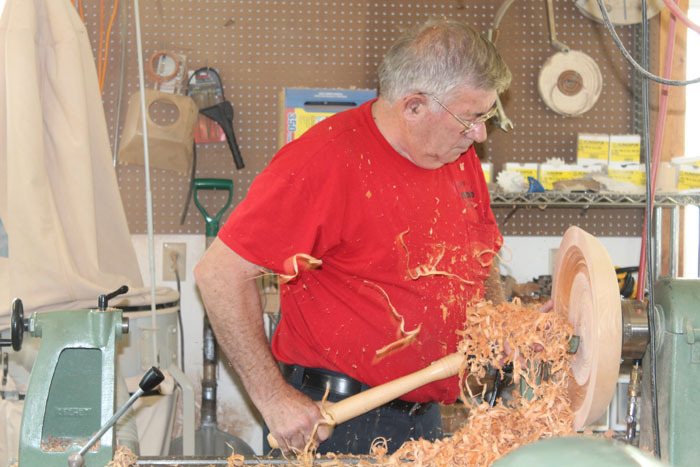 Upon arrival, most visitors are interested in the log piles, the tractor, chainsaws and other evidence of the rough work that goes into making our authentic Vermont wooden bowls. We buy logs from local loggers, and only use wood that is native to our area for our bowls. People sometimes bring us special wood, perhaps from a tree on their property, which we are happy to turn as a custom project. Our woodworking studio is open to the public. When visitors enter the workshop, they'll often see the bowl-making process 'in progress', with bowls in various stages of completion being turned on our equipment. Our bowls take just over a year to make, and no two bowls are alike. We start with a green block of wood, perhaps a burl or wood from an old rough looking tree that has been standing on a fence line for a hundred years or more and let the wood show us what it would like to become. We purposely leave a 10% thickness on the rough bowl and coat it generously with wax. The bowl is then stored for a full year so it can dry completely, slowly and naturally. The slow-drying will slightly warp and twist the bowl, but it is slow enough that the bowl rarely cracks or splits. At the end of the year, the extra thickness that we left on the bowl before drying allows us enough material to re-turn the bowl to its final shape and finish it with food-safe oil. When a project is complete, we sign and date each bowl and mark it with the type and source of the wood and that it was handcrafted in East Burke, Vermont. The wood for our creations has already lived one lifetime in the tree. Weeza and I work together at Sanderson's Vermont Bowls to give that wood a second life by creating hand-turned wooden bowls that our customers will cherish for years to come. We hope that you will stop by our farm and studio when visiting Vermont's Northeast Kingdom, or shop online here to bring our authentic Vermont wooden bowls home to you."